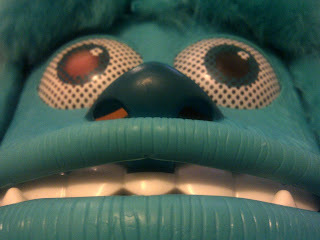 Monsters University the film all Disney fan's are talking about at the moment, the film all Monster's Inc fans are raving about and the film me and Spud went to see at the cinema yesterday (read are review of the film here) has officially been released and Spin Master have a range of fabulous toys they have released for all mini fans of MU (Monsters University) and Monsters Inc. 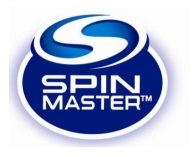 Spin Master very kindly sent Spud a selection of their Monsters University range, I think they know how mad Spud is with Disney, its safe to say he's quite obsessed! 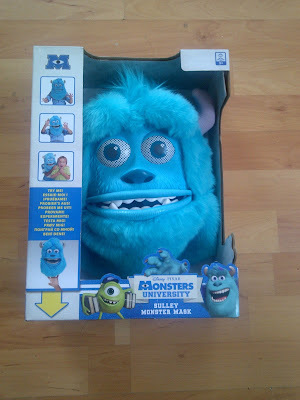 First up for review from Spin Master is this very big, fun, clever, funky and cool Sulley monster mask, and thanks to Spin Master, one of my lucky readers/visitors can enter the competition for your chance to win a mask of your very own! 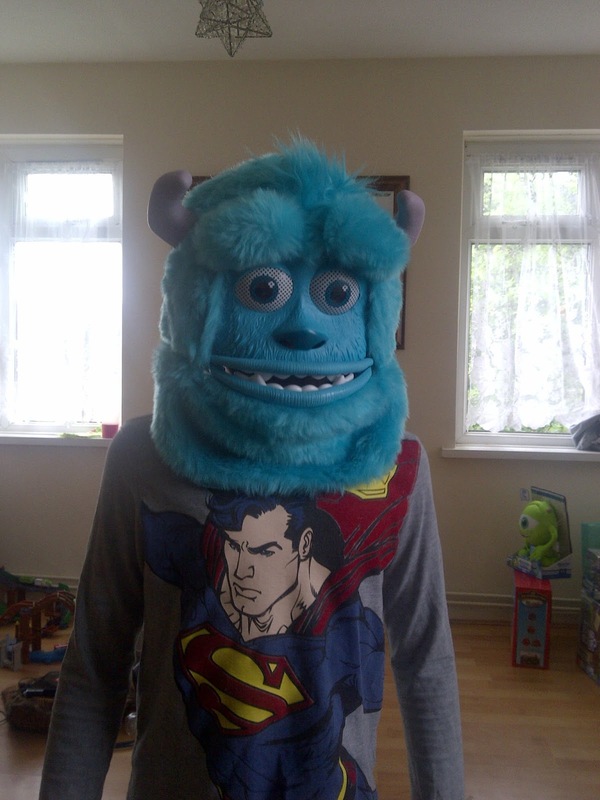 Spud picked up the mask out of the range we was sent straight away, the familiar face of Sulley caught his attention and he was sure he wanted to review this first. The mask is very impressive, not like the cheap tacky mask you get for Halloween, the mask is strong and sturdy and has velcro straps for fastening the mask on your child's head correctly, or if your like me, and keen to try it out yourself, it even fits adult heads too! The mask is soft and fluffy and is identical to the Sulley we all know and love, the mask looks really big to look at but the clever folks who designed it have made the back of the mask smaller on the inside for the child's face to fit into. 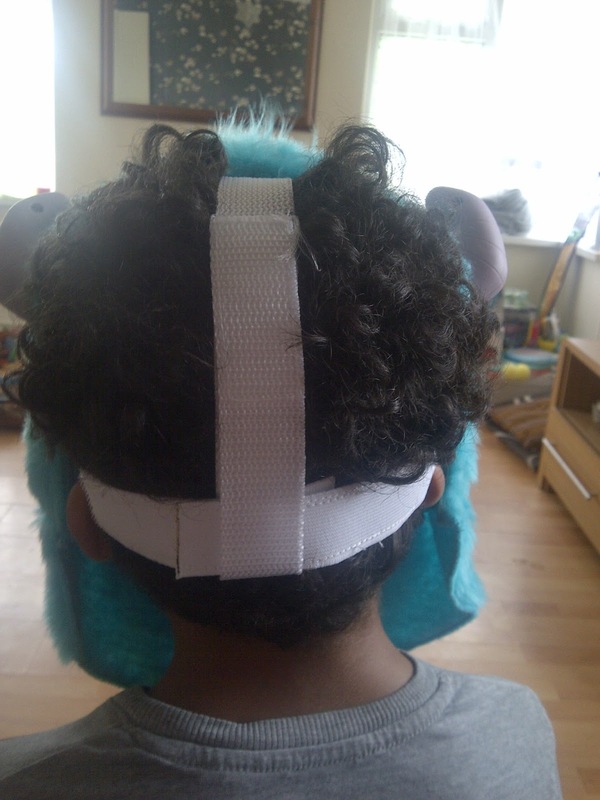 Using the velcro straps attached, you then simply fasten the straps to where you want them to be held in place and watch as your child transforms into Sulley instantly. 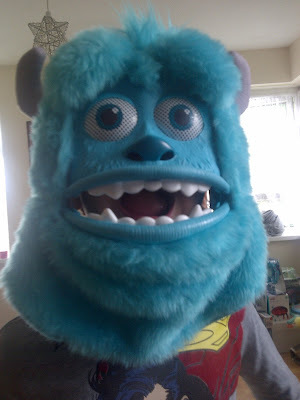 What we both love most about this mask is its moving features, thanks to the elastic inside the mask, if your child opens their mouth, or even moves their mouth, Sulley's mouth automatically opens and his eyebrows move too enabling your child to create fun, scary and memorable faces! When Spud was playing around with the mask roaring away at me, I couldn't help but giggle, it was amazing to see the moving features of the mask. I tried the mask on myself and could see very clearly out of it, I didn't feel suffocated and felt like I could breath perfectly normal out of it, even in the hot heated weather we have been blessed with recently! I do have a video of Spud that I will add to this post tomorrow, it was too large to upload via the netbook hence why it's not here at the moment. also see how big the nostrils on the mask are enabling your child to breath safely. The Sulley Monster Mask suitable for ages 3+ is available to buy with a suggested RRP of £24.99 from The Disney Store, The Entertainer, Smyths Toys, ELC, Tesco, Toys R Us and many more places. 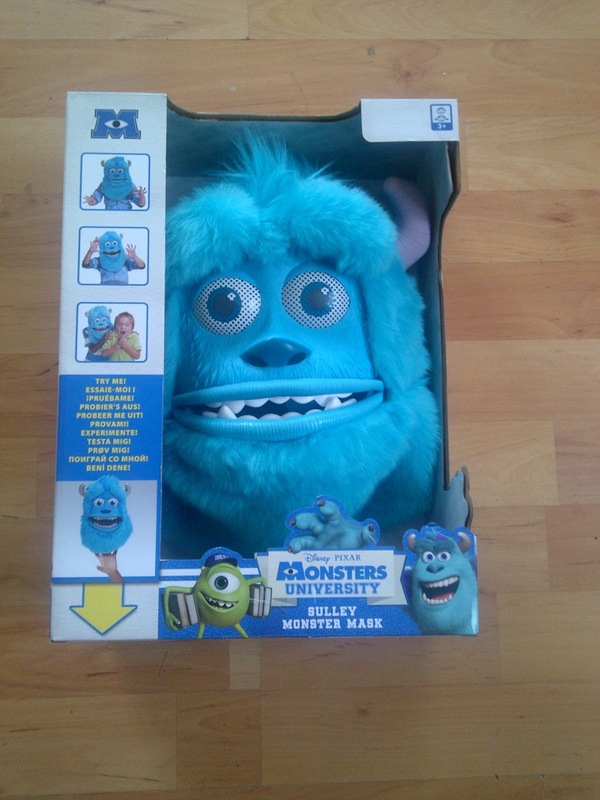 For your chance to win a Spin Master Monsters University Sulley Monster Mask, enter the competition here.